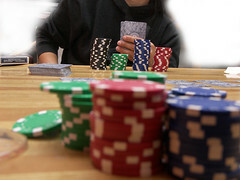 When deciding to play a game of poker, I always base my decision of what game levels to play based on my bankroll size. Your bankroll is the total amount of money that you have available to play poker. It includes the money that you have set aside strictly for poker. Bankroll refers to total monies not just what you plan to spend at one session. I have read lots of differing views as to what your bankroll size should be. The whole idea of having a bankroll is to allow you to play your best but to allow for a streak of bad beats. Even the best of players can get stuck, not winning, for hours, days, weeks or even months. During that time a sufficient bankroll will help them continue to play until they start winning again. One thing that a new player turning pro should also consider is that after a few months of straight decline, they might just be a losing player. Maybe they should consider just playing for fun or very low limits instead. They may just need to change the way they play. There are so many suggestions by various people as to what the bankroll size should be that I picked the following one. I try to allow myself to have a bankroll worth 4,000 times the big blind. 20 sessions minimum playing No Limit games with a buy-in amount equal to 200 times the big blind. 40 sessions minimum playing No Limit games with a buy-in amount equal to 100 times the big blind. 100 sessions minimum playing Limit games with a buy-in amount equal to 40 times the big blind. 200 sessions minimum playing Limit games with a buy-in amount equal to 40 times the big blind. The math is not perfect but the above formula allows the following games amounts to be played based on the following bankrolls. Using a spreadsheet will get you more accurate results. These are just my opinions and I am trying to be conservative as well. You can always try to play above your level for a session or two, but it is a good idea to stay in your bankroll level or comfort zone even if that level is lower. If you are on a losing streak, check your bankroll size and move down a level based on the remaining size. This will keep you going longer. Only move up a level when your bankroll can sustain that level. Best of luck and be careful out there. ← Reminder: The TPT:Stars Event #7 is Thursday night at 9:00 pm ET. “They may just need to change the way they play.”I would love to hear more about changing up your game when on a losing streak. I mentioned in a comment before that I play with a regular group of friends and one guy seems to win more than the rest. He's probably the best player of the group, but I also think that my game has become too predictable, conservative, and stale. What could I do at my next game to turn things around? One way to change up your game is to raise or re-raise with your good hands. Don't go all in but do bet a little more actively when you are in position. Try stealing the blinds once in a way with a bet increase in a limit game and a 2 1.2 times big blind bet in no-limit. If you get played back, you can always back off. Once in a while lead off with a bet or a raise even with a bad hand. In fact, never play the same hand the same way could help. Like raising or calling with AA. Most of the time pre-flop, you would raise. Perhaps 1 out of 3 times you could just call. You could even be loose for say three or four hands in a row and then tighten up. I will post more on that in a later post. I was gutted to play 2 out of 3 games last night where I wasn't in the money! One mistake I made in my post was that these suggestions were for cash games and ring games. For tournament play you might need up to 10,000 time the big blind as most people don’t win more than one out of 100 or so of the big tourneys.